LOVE IT! Can’t wait til January to read it!! All the best for the blog and your book. Congrats on the book deal! That is amazing. Looking forward to hearing more about it and of course, reading the book. Here via Allison Winn Scotch’s website. (Saw your comment on her post today, and loved the title of your book/blog!) Despite having great friends from home, it took me years to find “BFFs” after I graduated college and moved to a new city. I think your story is neither embarrassing nor unusual — in fact, I think it’s a common modern-day issue and I’m glad you’ve written about it! I didn’t realize you had a book deal! Can’t wait to buy it! Well done girl! I most certainly can’t wait to get a copy. Pre-order is on the way :-). BRAVA! Ordered all the way to Scotland! I’ve been reading your blog for nearly a year so I honestly cannot wait for the book. I just received my copy in today’s mail 🙂 Not going to lie, it’s tempting to call out of work today… remind me that I have the next two days off to enjoy it! You look good in print, Rachel! Thanks again Leigh! Happy reading! Hi, Rachel! I just finished your book and loved it! It was really great how you mixed in all of the scientific research with the whole journey. One of the things I found most interesting was the 150 number. Well while yours was 20/150 spots to fill, when I made my list after starting your book I ended up with about 130/150 spots to fill. Of the almost 20 friends(it’s 19, but I rounded up) 3 are girls I’d consider close to lifers, but one lives out of state and the 2 others I rarely speak to or meet up with. 1 is a guy I’ve known for years online, but not in person (I moved out of state so we’ll probably never meet; does that even count? ), again rarely talk. 1 I’ve spoken to on the phone once, she needed a favor. She invited me to a short-lived adoption book club, where I met another 1, but we’ve only exchanged a few emails months ago. With the others all but one are people my husband introduced me to through his work. I love the idea of your friend quest, but I think I sound similar to your more reserved self as you started your journey. Also, I would have probably had an easier time a few years ago when I just moved here because now I have a little one. I couldn’t imagine you attempting all of those friend-dates with an almost 2 year old little girl in tow. I’m not a Mommy&Me girl so I’d love some advice, if you’ve got any. I’ll definitely work on the being more aware when I’m out and trying to talk to people, but I just never seem to find the open people I’m looking for. Thanks for reading my message and for writing your wonderful book! I’m glad you’re getting to pursue your passion! 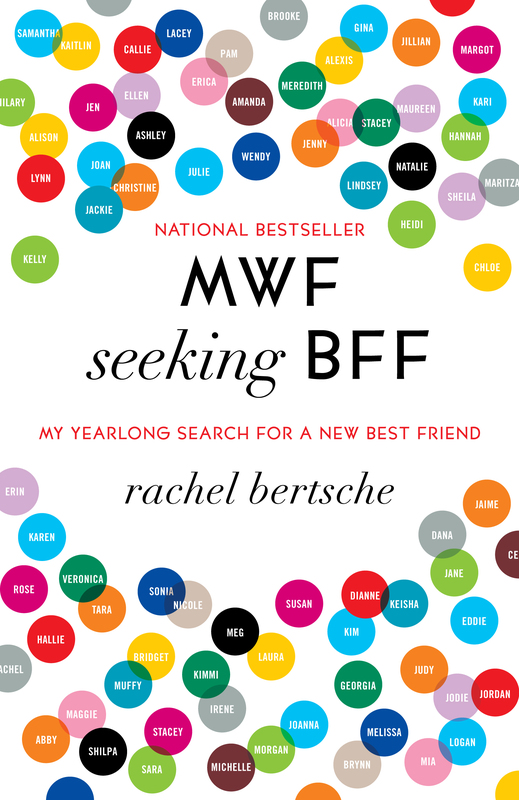 Thanks so much for reading MWF Seeking BFF. I’m so glad you liked it! It’s so interesting to make our own Dunbar lists, I think. Really opens our eyes to our own situations. As you say, another thing is just having your eyes and ears open. It’s so easy to get caught up in our own thing when we’re out and about, going about our business. Tuning into the other people around us who might be open to friendship is tough but important. If you keep at it, I think you’ll be surprised to find that a lot of people will be thrilled to be approached. Who doesn’t like hearing from others that we seem like a nice, friendable person? I just ordered your book-ever since my bff decided to abandon me and move to Europe, I must admit, I’ve felt a bit lonely. Been thinking lately that I need to make more “good” friends-this book sounds like a great start. So excited to read it! Thanks Elsie! I hope you enjoy it! Hey Rachel- happy to see your book is doing so well! It’s crazy that we sat at Nookie’s discussing your bff search after dance class many many months ago- and now that I just moved to a new city, people keep telling me to read your book to get ideas! Excited to pick it up. Thanks Felicia! So great to hear from you! Hi Rachel! I just finished your book! I was born and raised in the northwest burbs of Chicago. And now I’m in Texas, where I only know a handful of people. It’s interesting how I came across your book — I was leaving Chicago, heading to Arizona over the holidays, when I saw your book in the airplane magazine and I thought to myself I HAVE TO GET THIS BOOK! Anyway, thanks again.. It was a wonderful read! I really enjoyed it. I loved your book. I sent it to a few far-flung friends, I recommended it for my book group, and I posted an entry on my blog about it at http://www.fullexperiencecoachingnewsletter.blogspot.com (The title of the post is “In Friendship…”). But most importantly, since reading it, I’ve scheduled about 10 “friend dates” of my own and my whole outlook is just a lot happier. You are a terrific writer, and a thoughtful and insightful person. I really relate to your experience and see a lot of myself in your descriptions of yourself. Thanks for sharing this book with the rest of us. Thanks so much for these kind words Sophie! I so appreciate your support, and I’m so thrilled to hear it’s helping you in your own “BFF search.” THANK YOU! Wow, I can’t wait to get this book:D great concept, way to go Rachel! I live in a ‘university town’ met lots of amazing friends in my degree but then the parties ended and everyone moved away for work:( I found work and my fiance and so I stayed (behind). I miss my girls!! So I fell in love with your book title as soon as i heard it, then watched the trailer, and going to get a copy ASAP, awesome work! I guess I’ll find out if your plan worked or you’re still searching:) Thanks for writing this book. Just ordered the book, and posted about it and your wonderful blog. I have been doing a Lent series on my blog, and part of it is dealing with my need for a new friend. This really spoke to my heart and I am encouraged by what I have read so far. I can’t wait to get the book in the mail! I linked over and credited your blog and book on my post, of course! Thank you for being brave enough to forge this frontier! Here is the link to my post.. Thank you very much for your valuable advice on how to blog. Hope it will help me a lot in future.. I have been trying hard how to use the blogs well, but I feel I just don’t not have the idea of IT. Pingback: Graduation Wish List. | A Strong Cup of Coffee. I just finished the book and am determined to start putting some of those ideas into action. I was friendly and outgoing and would try things with the idea of meeting people, rather than be afraid of going alone and I don’t know when that changed, but I need to change back. I think it was when I thought I found a BFF but it ended badly and I decided to stop trying to be anyone’s friend. Hi Rachel! I just moved to Austin, TX two months ago and your book has helped me SO MUCH! I can’t say enough about how I loved this book. I just posted a review about it on my blog, hope that’s okay!! I’m looking forward to reading this book but based on your description, is it possible to have a bff even if you have to plan in advance? I have never been one for last minute hang outs since there are so many in betweens and i make my schedule in advance. I also tend to stick what I had planned unless I have the ability to be flexible. Don’t get me wrong, I love the last minute lets get a drink or two but I just don’t see it being feasible as I get older. Thus, not sure if it’s a necessity in a potential BFF. http://www.PostingTrader.com for Free Reviews and other Posting. How do posting positive reviews help in your businesses Google ranking? Tired of review sites or need Reputation work? Hire us to knock them off the front page of Google under your search term. Okay, this is just TOO cool. I need to read this ASAP. I look forward to getting to know/you your blog better! Thanks Jules! I’ve heard great things about your blog as well! Let’s be blog besties. I just finished reading your book and LOVED it! I really enjoyed the fun tone, the mixture of research and personal experiences, and the purpose of your search. So fun! Pingback: Can You Be Too Fabulous For Friendship? Just finished your book today & wanted to let you know how much I enjoyed it! Like others have said, I love the research woven into the story of your search for a local BFF. You have truly inspired me! I takes guts to “ask girls out”, but you show that it’s not so scary (or maybe it is, but the consequences are not). Wishing you continued success! I wonder how much your book also discusses female cattiness and competition.. and the role it plays in ruining friendships. Loved your book. As a 52 year old woman starting over after divorce, I can relate to pretty much everything you wrote. Living in a town that I was only known as part of a married couple, it is hard to find new friends. Thank you for giving me hope! I remember feeling this way after i got married and was almost 30…how do I make new best friends?? Both of my b.f.f.’s lived out of state (bastards! lol jk) so I just had my husband and family. Which, of course is wonderful, but I need a girlfriend!! That’s when I saw this book and felt comfort in knowing that it’s not just me, and that it is hard to find a new best friend as an adult! Thank you for writing this book, I’m a HUGE fan and look forward to your new one! Please check out my blog when you get the chance, I’d love your feedback!! I love this book and am immediately passing it on to my best friend. I love your genuine writing style and the research you did to support your quest that was so well interwoven that you didnt realize it was secondary data. I was about to embark on a similar quest until I read this book. Now I feel like I have a better understanding of friendships and what I was looking for. Also, it helped me take the pressure off my realationship, realizing that even if men are great, they really cannot be everything. Fantastic book, a must read for all 20 something girls. Do you prefer something super new? Take a look at this page. Only there the choice of young girls for every desire and completely free! They are good slaves, they will and want perform everything you say ! Hello! I run a CBD products online shop https://tryplainjane.com and am seeking to grow my CBD product range. Could anybody here suggest a good wholesale supplier of CBD Sweets You can respond here or drop me a message on Facebook https://www.facebook.com/plainjanehemp . I have tried The Eliquid Boutique in the UK but haven’t yet heard back from them.